Written By: Calvin A. Colarusso, M.D. Wouldn't it be useful to know how infants and toddlers differ mentally from adults and how your experience during the first few years of life affects your experience as an adult? 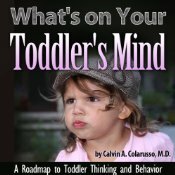 What's on Your Toddler's Mind: A Roadmap to Toddler Thinking and Behavior provides answers to those questions. Fascinating aspects of infant development, such as how an infant comes to develop a sense of self are addressed. Toddlers are eternally fascinating and frustrating. This audiobook explains the causes, and developmental benefits, of the two-year-old's messiness, negativism, motor restlessness and boundless energy, behaviors that tend to drive parents crazy. With humor and understanding Calvin Colarusso M.D. , child psychiatrist, brings his fifty years of experience of helping parents of infants and toddlers maximize their child's developmental potential and enjoy the heck out of the experience. Think of this book as a fascinating source of knowledge of early child development that is filled with examples of situations that every parent of infants and toddlers experiences and suggestions for how to manage them. And as a bonus, learn something about yourself! by Calvin A. Colarusso, M.D.